This product is custom fit for Amazon Echo. Made by pure silicon rubber. OAD finished, soft touch feeling and easy to cleaning. he top and bottom edges been covered well for shock proofing. Different color available, DIY design for different combination to stylish your Echo. The Amazon Echo is not included. Protect and keep your Amazon Echo looking great with this silicone case. Premium silicone. Provide protection for the aluminum body scratches, dings, and other daily wear and tear. Perfect cutouts for all buttons and ports. Easy top-loading and nearly perfect acoustical transparency for full in-case functionality. Easy to install and secure. Available in a variety of bright, colors to suit your favors. Protective, stylish and easy to use. A perfect companion for an easy and enjoy life! 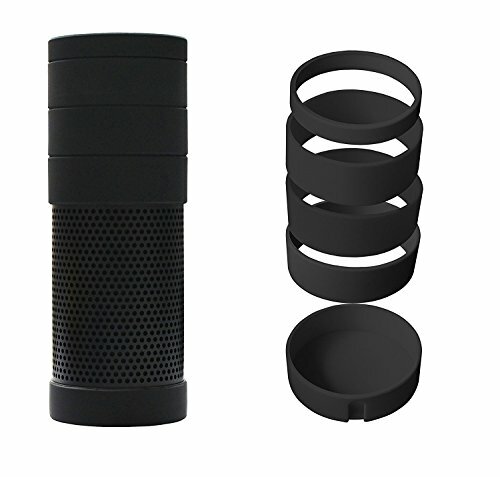 Customized silicone case for your Amazon Echo 1nd generation . Provides protection for the aluminum body against Scratches, greasy dirt and abrasions. Full function access to your echo, volume rotating control, voice controlling and led indicating are not be interfered,Easy to install and secure. Made by pure silicon rubber. OAD finished, soft touch feeling and easy to cleaning. he top and bottom edges been covered well for shock proofing. Exquisite Fun design matching colors strengthen the fashion Sense, can be placed anywhere like a decoration. If you have any questions about this product by Meres, contact us by completing and submitting the form below. If you are looking for a specif part number, please include it with your message.